I was hoping to post this yesterday but ran out of time. Better late than never. For my American readers (ha) who have yet to vote may I offer some food for thought? Your vote isn’t going to swing the election one way or another. Even if you gather a hundred of your friends and have them vote with you it won’t swing the election. And unless you live in one of the eight or so swing states it won’t even mater if you gather up 1000 people to vote with you. The President is elected by the electoral college and in most states, the outcome is set in stone. The whole Red Team vs. Blue Team is just psychological BS propaganda that has been programed into us by the media and entrenched interests. Don’t fall for it! If you really think Obama is the best man for the job then by all means vote for him. Same goes for Romney. I, for one, think there is maybe 5% difference between them. I would urge people to look into the third party candidates and find the candidate that best matches their beliefs. 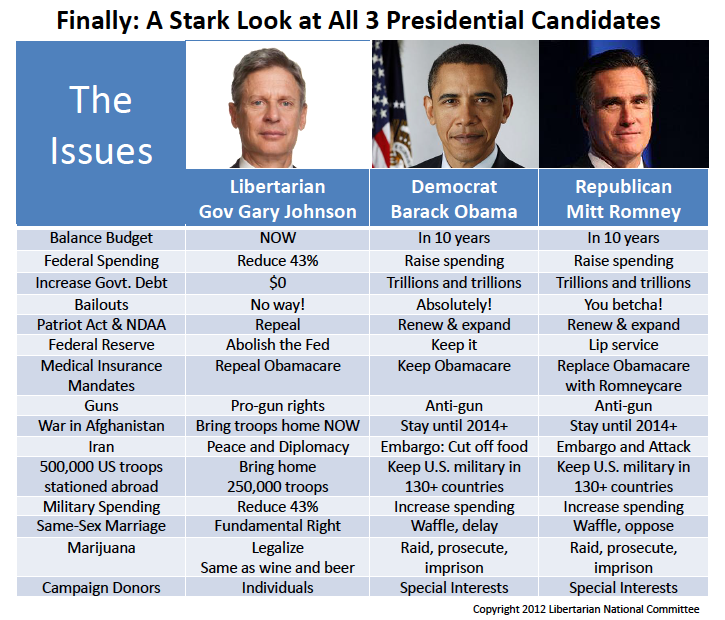 The chart below shows how one of those candidates, Gary Johnson stacks up to Obomney. I will be voting for Gary Johnson and I think he would do a fantastic job as President. I know he won’t win, but I will be voting with a clear conscience. Check out this campaign ad for a little more on his background. A libertarian vote is particularly important this year. The Ron Paul Revolution has introduced hundreds of thousands of voters to the concepts of liberty and the Libertarian Party has an opportunity to reach some important milestones. If Gary Johnson gets 1% of the vote he will be only the second Libertarian to reach that mark. If he gets 2% he will be making history. If he gets 5%, the Libertarian party will be considered a major party and get the same federal campaign funds that the Democrats and Republicans have been stealing from voters receiving for years which will dramatically help their ballot access efforts in the future. One more recommendation for voters in SF: John Dennis is an excellent Ron Paul Republican running against Nancy Pelosi. I will be happily voting for him. Aside from the people on the ballot, there are several interesting and important statewide ballot initiatives to consider. I am particularly interested to see what happens in the nine states voting on nullification measures, especially those voting on the legalization of marijuana. If you would like to see where the Libertarian Party stands of the ballot measures in your state check it out here. This entry was posted in Politics and tagged election, Gary Johnson, libertarian, Obama, President, Romney, third parties, vote. Bookmark the permalink. Well put, Mike. I think that 5% difference is largely based on what they say, which is not to be confused with what they actually think or what they would actually do.